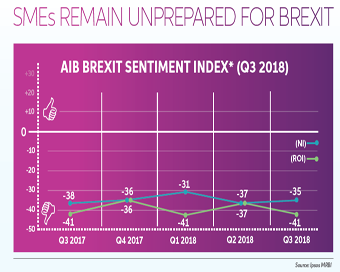 The AIB Brexit Sentiment Index for Q3 2018 reveals 63% of Republic of Ireland (ROI) SMEs believed Brexit would have a negative impact on their business, up from 58% in Q2 2018. 74% of SMEs in RoI believed it would have a wider negative economic impact. Meanwhile 44% of RoI SMEs say Brexit is resulting in a negative outlook for their sector. And only 5% of ROI SMEs have a formal plan in place, with 3% in Northern Ireland having a plan. The Brexit Sentiment Index baseline is zero, with a potential range from +100 to -100. For Q3 2018, the Index registered a score of -41 in the ROI, from -37 in Q2, and -35 in Northern Ireland for Q3 2018 from -37 in Q2 2018. This means RoI has become slightly more negative in outlook when it comes to the impact Brexit may have on their business than in Q2 2018. The Index shows SMEs operating in retail (-40), manufacturing (-43) and tourism (-49) are the most pessimistic in terms of sentiment.